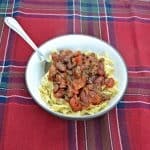 With warmer days approaching I really enjoy trying to make lighter yet filling meals. I make a lot of entree salads because they are easy to make, full of vegetables, and are filling due to their protein. One of my favorite salads is one with steak and french fries on top. Fries seem to be a Pittsburgh thing on salads and I often put them on mine as well because I love them. So what else comes on a steakhouse salad? There are vegetables, caramelized onions, bacon, cheese, and croutons. It has all of my favorite things on it. Plus I like to make my homemade Ranch dressing with it, especially once the herbs start growing in my yard. 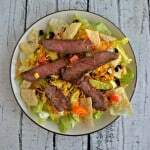 You can use a lot of different types of steak in this salad but I like to make it with a London Broil. I usually make one that is close to two pounds so that we can use a pound for the salads and then have a pound leftover to enjoy on top of nachos, on a sandwich, or on another salad. When it comes to London Broil I love using Certified Angus Beef Brand. It’s a delicious piece of meat and I know I’ll love it every time. The hardest part of making this whole salad was coming up with a rub for the steak. I have a few pre-made spice rubs in the cupboard but none of the sounded right with my salad. So I whipped up a quick liquid marinade and put the London Broil in it for a few hours. In all honesty, London Broil does better if it sits in a liquid marinade for a few hours before cooking because it really tenderizes it. 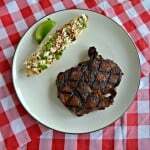 We ended up cooking this steak on the grill which was a great choice. The outside was nice and seared while the inside was a perfect medium. It tasted great paired with the fresh vegetables, blue cheese, crispy french fries, and caramelized onions. It’s basically a dream salad! Instead of using store bought dressing I made my own Ranch. 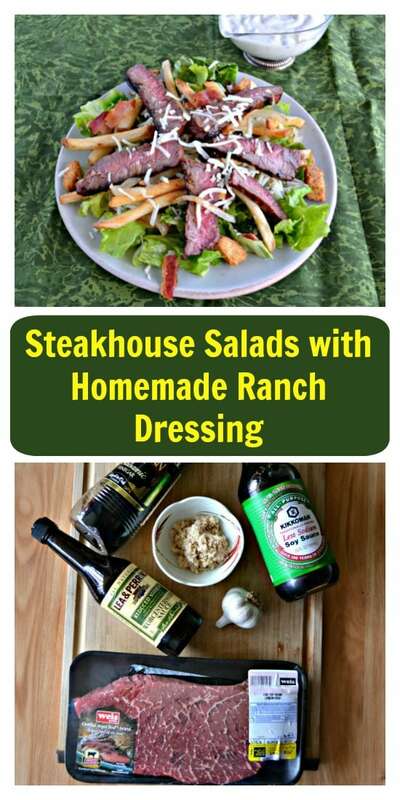 I know a lot of people would rather have Blue Cheese dressing and in order to make that you can simply add some Blue Cheese to the Ranch dressing recipe. 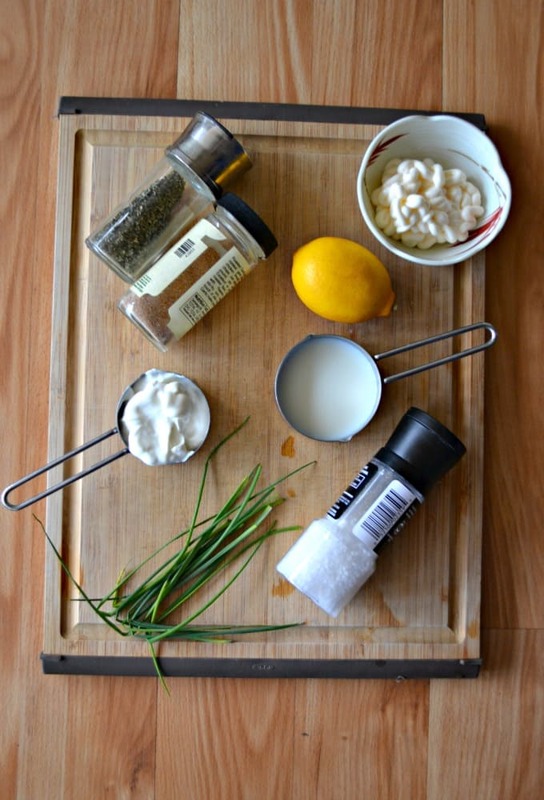 This Ranch dressing is best made a day ahead of time so that the herbs have time to flavor the dressing. It will last for a week in the refrigerator and is a delicious and creamy dressing that goes perfectly with this steakhouse salad. 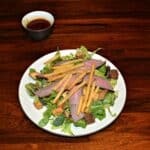 So grab yourself a London Broil, some french fries, and some vegetables and make this delicious salad worthy of being in a steakhouse! 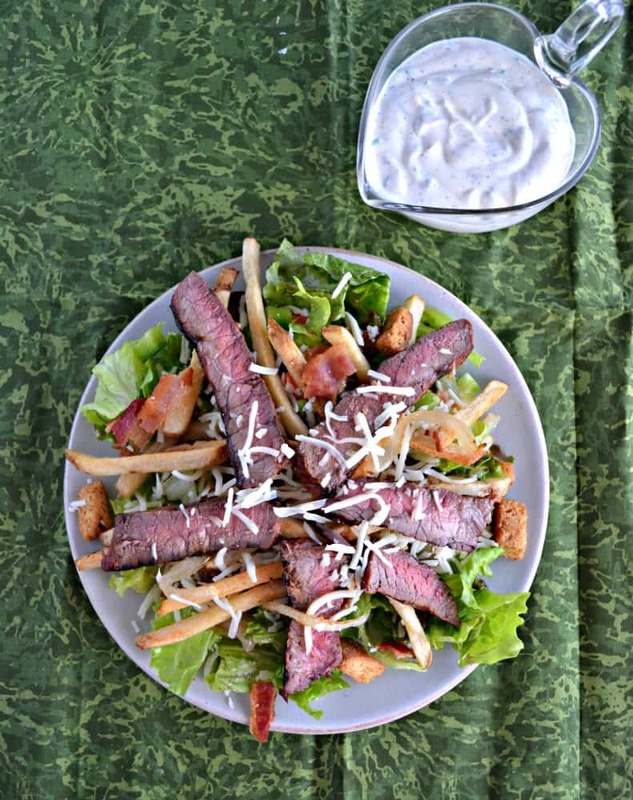 You don't have to go to a steakhouse to get a delicious steak salad topped with french fries, vegetables, caramelized onions, and homemade Ranch dressing! Combine all the ingredients for the marinade in a shallow container with a lid. Add in the London Broil, cover, and marinate for 4 hours. To make the Ranch dressing combine all ingredients in a Mason jar, put the lid on, and shake it vigorously. Refrigerate until ready to use. To make the salads place the lettuce, peppers, onion, and carrots in a large bowl and toss. To make the steak heat an outdoor grill over high heat. 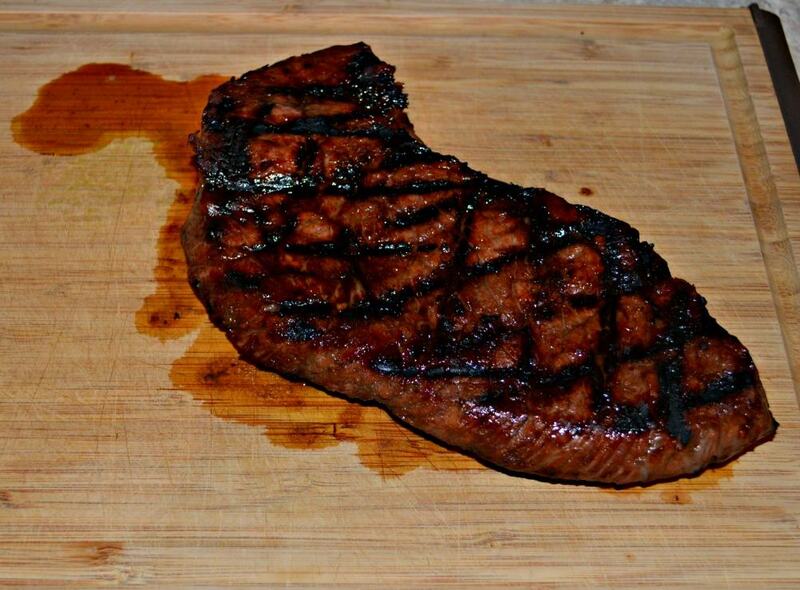 Place the London Broil on the grill and cook for 3 minutes on one side and then flip. Continue cooking over direct heat until the internal temperature reaches 135. Remove from heat and let rest for 5 minutes before slicing thinly. To make the salads divide the lettuce mixture between four plates. Divide the bacon, cheeses, and croutons between the four plates. 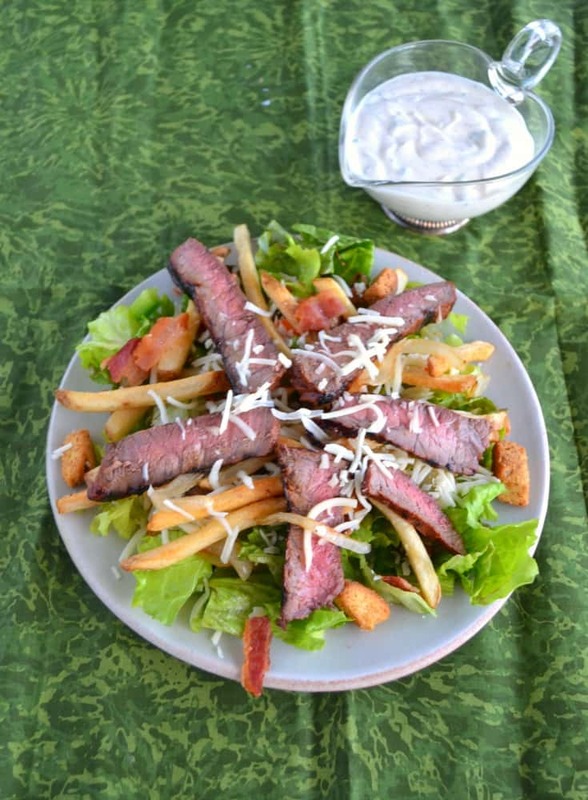 Pile steak and fries on top of each salad and pour the homemade Ranch dressing over top.